I never thought that I’d say it, but I love my phone, and would find life without it very difficult. But not just any phone, my blackberry. 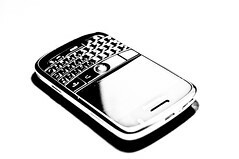 I have a Blackberry Bold 9000, and while originally buying it because it was slightly geeky (and not an iPhone), I have truly come to love this phone. I love the qwerty keyboard, and the scroll ball (to the point where I may not upgrade to the next bolds because they don’t have the scroll balls). I love the fact that my e-mails come to me as soon as they are received. I love being able to share on Facebook and twitter so easily through native apps. GPS through Google Maps works incredibly well, and I can also use it to record my golfing statistics. I loved having this phone with me when I went on tour a while ago. A 16gb Micro-SD card allowed me to store a whole heap of music and movies to keep me entertained on the bus rides to and from rehearsal venues. Things I don’t like about the phone is that the camera isn’t great in dark light, and the picture will come out very grainy whenever the flash is used. The trackball also can get stuck (I’ve had to replace it once). And I don’t like that despite there being updated operating systems for the phone that are out there and are being used by other networks, my carrier is a good number of updates behind. But I have got to the stage that moving to another phone will be tricky. I’ll adapt, but I really like my phone.